If you are planning to spend your holidays in Greece, you should consider visiting the Peloponnese. The flora and fauna is unique in Greece, some herbs can only be found here! Visitors of the Peloponnese can find many sights of interest, like Ancient Olympia – the birth place of the Olympic Games, Nafplion – the first capital of the Greek state, the ancient amphitheatre of Epidaurus the largest outdoor amphitheatre with amazing acoustics. In the summertime ancient theatre is played. The Peloponnese, Peloponnes or Peloponnisos is technically an island since the construction of the Corinth Canal (Isthmus) in the year 1893. The peninsula has been inhabited since prehistoric times. Its modern name derives from ancient Greek mythology, specifically the legend of the hero Pelops who was said to have conquered the entire region. The name Peloponnesos means “Island of Pelops”. Today visitors can reach the Peloponnese by ferryboat via Patra or by airplane through the airport Araxos near Patra (only charter flights or private jets), Kalamata or Athens (regular commercial flights). Antonios Village, a 4 star category hotel, is located a few meters from the beautiful Glyfa Beach between Vartholomio and Arkoudi in the north-west of the Peloponnese. Almost the whole west coast of Peloponnese has a fine sandy beach, leaving enough space for everyone even in the high season July and August. The distance to Patra, which is the main point of arrival for ferries from Italy and the Ionian islands, is about 80km. To the airport of Araxos the distance is just 50km. Sweeping views encircle this luxury retreat which has been inspired by the elements. 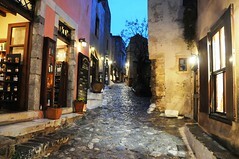 Antonios Village is bathed in tranquil lighting that emphasizes the harmonious, earthy tones of the environment around it. The brand new complex consist of fully furnished luxurious apartments with spacious bathroom, kitchen for self-catering, flat screen TV, telephone, wireless Internet access and a open fire place. A villa with private swimming pool is available for all those seeking for ultimate comfort and privacy. Special rates for guests who want to stay longer. Families with children can be assured that they will spend their holidays in a family friendly environment. In the restaurant of Antonios Village, traditional Greek and international cuisine is offered in a warm and friendly atmosphere. The hotel bar provides different cocktails and local wines. The large swimming pool has a pool bar, “kids’ area” and is surrounded by sun-beds and umbrellas. If you are planning to get married in Greece and want to offer your guests an unforgettable wedding party, with or without accommodation, the chef of Antonios Village Restaurant will be pleased, to assist you with the choice of the menu. Also for business meetings you can be asure to find an exclusive atmosphere for you and your business partners, so that the success of your event will be guaranteed. The friendly and professional staff is very flexible and open for new ideas. “Excellent service is our top priority”. Nikos Melisis is looking forward, to welcome you at Antonios Village – Glyfa Beach – Peloponnese – Greece. Living in Parga, Greece since 2002. Providing complete advertising solutions for web, video and print. 360° virtual and interactive tours for publishing on CD/DVD or on your website.